As they extended an array of invitations and welcomed others into their home, they transformed their living space to be a holy space—a space for God to meet all who were seeking to belong. It was in listening to and facing the realities of local young people that they began to offer meals and empathy to all who would walk through their door. What may have been perceived as another group of young adults with mismatched furniture was in fact a taste of heaven on earth. This work does not come easy, but it is a work to which they are committed. Yet while young people in our nation are growing increasingly diverse, most ministry approaches and resources have not yet adapted. In response to this gap, we at FYI have intentionally worked to develop deeper relationships with leaders from African American, Asian, Latina, and multiethnic churches. This past year, we spent significant time listening to and developing trusted conversation partners thanks to a grant-funded research project. The goal of the Multicultural Youth Ministry Project was to understand how and why ethnic-specific and ethnically diverse churches are effectively engaging young people in order to increase the capacity of youth ministry leaders so they can equip young people with the lifelong faith they need. Through the research process, we were able to make a number of visits to 12 multiethnic churches in the Los Angeles area. Interviews and focus groups explored how youth and young adult ministries were conducted in the church, how cultural dynamics influenced ministry with young people, and the presence of specific themes identified from the Growing Young research. After our time of listening and learning, we hosted a Multicultural Youth Ministry Summit. The gathering included 27 leaders spanning each cultural context in order to explore the research findings, illuminate those findings with additional insights and stories—from our conversations throughout the year as well as attendees’ own experiences—and collaborate on next-step resource possibilities. It was a gathering that confirmed that this conversation is not just important, but crucial for such a time as this. It also deepened our understanding and left us with more questions to explore, more stories to bask in, and an incredible group of leaders who are so committed to walk alongside us in the process. In the coming months, you will be able to read from and get to know some of the leaders we have had the privilege of learning alongside. I am excited for you to be able to get a glimpse of what God is doing through leaders of color all around the United States. We see diversity as a gift. But often when we talk about all the layers of diversity with which we have been gifted, our temptation is to just couch ourselves in the challenging reality of the work. While that is true and it is helpful to name, it is also important to recognize the world of opportunities that accompany the challenges. To be faithful to this belief, we have named values that will guide the conversations and resources that you will see in the coming months. 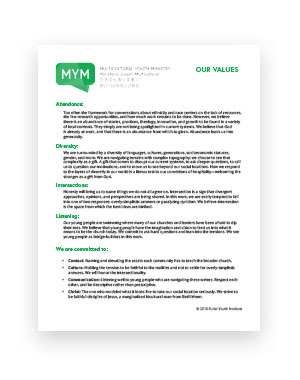 We encourage you to consider how these shared values might impact your own ministry’s approach to working with diverse groups of young people. Abundance: Too often the framework for conversations about ethnicity and race centers on the lack of resources, the few research opportunities, and how much work remains to be done. However, we believe there is an abundance of stories, practices, theology, innovation, and growth to be found in a variety of local contexts. They simply are not being spotlighted in current systems. We believe that God is already at work, and that there is an abundance from which to glean. Abundance leads us into generosity. Diversity: We are surrounded by a diversity of languages, cultures, generations, socioeconomic statuses, and more. We are navigating terrains with complex topography; we choose to see that complexity as a gift. A gift that comes to disrupt our current systems, to ask deeper questions, to call us to question our motivations, and to move us to see beyond our social locations. How we respond to the layers of diversity in our world is a litmus test to our convictions of hospitality—welcoming the stranger as a gift from God. Intersections: Honesty will bring us to name things we do not all agree on. Intersection is a sign that divergent approaches, opinions, and perspectives are being shared. In this work, we are easily tempted to fall into one of two responses: overly-simplistic answers or paralyzing cynicism. We believe intersection is the space from which the best ideas are birthed. Listening: Our young people are swimming where many of our churches and leaders have been afraid to dip their toes. We believe that young people have the imagination and vision to lead us into what it means to be the church today. We commit to ask hard questions and lean into the tensions. We see young people as bridge-builders in this work. Context: Naming and elevating the assets each community has to teach the broader church. Culture: Holding the tension to be faithful to the realities and not to settle for overly-simplistic answers. We will honor the intersectionality. Communication: Listening well to young people who are navigating these waters. Respect each other, and be descriptive rather than prescriptive. Christ: The one who modeled what it looks like to take our social location seriously. We strive to be faithful disciples of Jesus, a marginalized bicultural man from Bethlehem. This is an invitation to join us. This work cannot be done by one person, one organization, or one church. As you look more deeply at the diversity with which your local church has been gifted, to what values are you pointing? To what commitments can you be held accountable? We are looking forward to this journey, juntos (together). This project consisted of a year of qualitative research with twelve diverse congregations as well as a comprehensive literature review. The twelve congregations participating in the study included three Asian/Asian American churches (two Chinese, one Korean), three African American churches, three Latino/a (primarily Guatemalan, Mexican, and multi-Latino respectively) churches, and three multiethnic churches (defined as 20% or more of at least one non-dominant cultural group). The research explored congregations’ best practices in their engagement of young people (ages 15-29 by our terminology, and expanded to however each church defines “young people”). We included an average of 25 formal research participants for each church site, for a total of 265 participants (who were generally included in interviews and focus groups), in addition to observing gathered worship and youth-specific programming. The research project was led by Mary Glenn and included Jennifer Guerra Aldana, JC Arce, Irene Cho, Stephen Finkel, Tyler Greenway, Brad Griffin, Patrick Jacques, Ruben Nuño, Giovanny Panginda, and Kara Powell, FYI executive director.